How does exercise reduce stress? Surprising answers to this question and more. Exercise is a form of physical stress. Can physical stress relieve mental stress? Alexander Pope thought so: "Strength of mind is exercise, not rest." Plato agreed: "Exercise would cure a guilty conscience." You'll think so, too — if you learn to apply the physical stress of exercise in a controlled, graded fashion. Aerobic exercise is key for your head, just as it is for your heart. You may not agree at first; indeed, the first steps are the hardest, and in the beginning, exercise will be more work than fun. But as you get into shape, you'll begin to tolerate exercise, then enjoy it, and finally depend on it. Regular aerobic exercise will bring remarkable changes to your body, your metabolism, your heart, and your spirits. It has a unique capacity to exhilarate and relax, to provide stimulation and calm, to counter depression and dissipate stress. It's a common experience among endurance athletes and has been verified in clinical trials that have successfully used exercise to treat anxiety disorders and clinical depression. If athletes and patients can derive psychological benefits from exercise, so can you. The mental benefits of aerobic exercise have a neurochemical basis. Exercise reduces levels of the body's stress hormones, such as adrenaline and cortisol. It also stimulates the production of endorphins, chemicals in the brain that are the body's natural painkillers and mood elevators. Endorphins are responsible for the "runner's high" and for the feelings of relaxation and optimism that accompany many hard workouts — or, at least, the hot shower after your exercise is over. Behavioral factors also contribute to the emotional benefits of exercise. As your waistline shrinks and your strength and stamina increase, your self-image will improve. You'll earn a sense of mastery and control, of pride and self-confidence. Your renewed vigor and energy will help you succeed in many tasks, and the discipline of regular exercise will help you achieve other important lifestyle goals. Exercise and sports also provide opportunities to get away from it all and to either enjoy some solitude or to make friends and build networks. "All men," wrote St. Thomas Aquinas, "need leisure." Exercise is play and recreation; when your body is busy, your mind will be distracted from the worries of daily life and will be free to think creatively. Almost any type of exercise will help. Many people find that using large muscle groups in a rhythmic, repetitive fashion works best; call it "muscular meditation," and you'll begin to understand how it works. Walking and jogging are prime examples. Even a simple 20-minute stroll can clear the mind and reduce stress. But some people prefer vigorous workouts that burn stress along with calories. That's one reason ellipticals are so popular. And the same stretching exercises that help relax your muscles after a hard workout will help relax your mind as well. Regular physical activity keeps you healthy as it reduces stress. But another special sort of exercise known as autoregulation exercises can also reduce stress. Stress comes in many forms and produces many symptoms. Mental symptoms range from worry and irritability to restlessness and insomnia, anger and hostility, or sensations of dread, foreboding, and even panic. Mental stress can also produce physical symptoms. Muscles are tense, resulting in fidgetiness, taut facial expressions, headaches, or neck and back pain. The mouth is dry, producing unquenchable thirst or perhaps the sensation of a lump in the throat that makes swallowing difficult. Clenched jaw muscles can produce jaw pain and headaches. The skin can be pale, sweaty, and clammy. Intestinal symptoms range from "butterflies" to heartburn, cramps, or diarrhea. Frequent urination may be a bother. A pounding pulse is common, as is chest tightness. Rapid breathing is also typical, and may be accompanied by sighing or repetitive coughing. In extreme cases, hyperventilation can lead to tingling of the face and fingers, muscle cramps, lightheadedness, and even fainting. The physical symptoms of stress are themselves distressing. In fact, the body's response to stress can feel so bad that it produces additional mental stress. During the stress response, then, mind and body can amplify each other's distress signals, creating a vicious cycle of tension and anxiety. Because the root cause of stress is emotional, it is best controlled by gaining insight, reducing life problems that trigger stress, and modifying behavior. But stress control can — and should — also involve the body. Aerobic exercise is one approach; physical fitness will help promote mental fitness. But there is another approach: you can learn to use your mind to relax your body. The relaxed body will, in turn, send signals of calm and control that help reduce mental tension. Autoregulation exercises are a group of techniques designed to replace the spiral of stress with a cycle of repose. Several approaches are available. Even without formal meditation and controlled breathing, the gentle muscle stretching of yoga can reduce stress. "Full service" yoga is even better. But if that's not your thing, simple breathing exercises can help by themselves. Rapid, shallow, erratic breathing is a common response to stress. Slow, deep, regular breathing is a sign of relaxation. You can learn to control your respirations so they mimic relaxation; the effect, in fact, will be relaxing. 1. Breathe in slowly and deeply, pushing your stomach out so that your diaphragm is put to maximal use. 3. Exhale slowly, thinking "relax." 4. Repeat the entire sequence five to 10 times, concentrating on breathing deeply and slowly. Deep breathing is easy to learn. You can do it at any time, in any place. You can use deep breathing to help dissipate stress as it occurs. Practice the routine in advance; then use it when you need it most. If you find it helpful, consider repeating the exercise four to six times a day — even on good days. Stressed muscles are tight, tense muscles. By learning to relax your muscles, you will be able to use your body to dissipate stress. Progressive muscle relaxation is best performed in a quiet, secluded place. You should be comfortably seated or stretched out on a firm mattress or mat. Until you learn the routine, have a friend recite the directions or listen to them on a tape, which you can prerecord yourself. Progressive muscle relaxation focuses sequentially on the major muscle groups. Tighten each muscle and maintain the contraction 20 seconds before slowly releasing it. As the muscle relaxes, concentrate on the release of tension and the sensation of relaxation. Start with your facial muscles, then work down the body. Wrinkle your forehead and arch your eyebrows. Hold; then relax. Close your eyes tightly. Hold; then relax. Clench your jaws tightly. Hold; then relax. Tense your neck by pulling your chin down to your chest. Hold; then relax. Breathe in as deeply as you can. Hold; then relax. Tense your stomach muscles. Hold; then relax. Tense your buttocks and thigh muscles. Hold; then relax. Tense your arms and clench your fists. Hold; then relax. Press your feet down. Hold; then relax. Pull your toes up. Hold; then relax. The entire routine should take 12 to 15 minutes. Practice it twice daily, expecting to master the technique and experience some relief of stress in about two weeks. Few things are more stressful than illness. Many forms of exercise reduce stress directly, and by preventing bodily illness, exercise has extra benefits for the mind. Regular physical activity will lower your blood pressure, improve your cholesterol, and reduce your blood sugar. 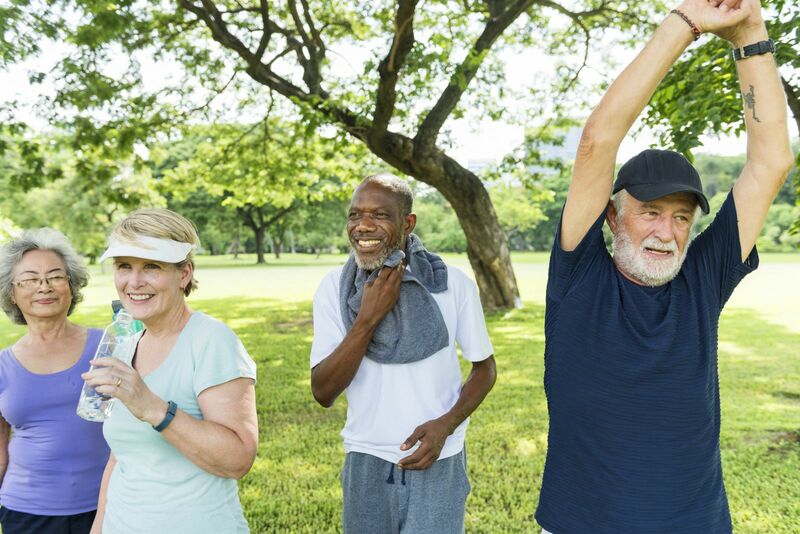 Exercise cuts the risk of heart attack, stroke, diabetes, colon and breast cancers, osteoporosis and fractures, obesity, depression, and even dementia (memory loss). Exercise slows the aging process, increases energy, and prolongs life. Except during illness, you should exercise nearly every day. That doesn't necessarily mean hitting the gym or training for a marathon. But it does mean 30 to 40 minutes of moderate exercise such as walking or 15 to 20 minutes of vigorous exercise. More is even better, but the first steps provide the most benefit. Aim to walk at least two miles a day, or do the equivalent amount of another activity. You can do it all at once or in 10- to 15-minute chunks if that fits your schedule better. Add a little strength training and stretching two to three times a week, and you'll have an excellent, balanced program for health and stress reduction. And if you need more help with stress, consider autoregulation exercises involving deep breathing or muscular relaxation. Remember, too, that mental exercises are the time-honored ways to cut stress (see box). Popular beliefs notwithstanding, exercise is relaxing.